Exterior of the historic Ford House in Mobile, Alabama. Even though she lives and works in Canada, Esther de Wolde has had a longstanding fascination with the American South and a passion for historic homes. Esther de Wolde at Ford home. As one of the founders and CEO of Phantom Screens, de Wolde has worked with Danny Lipford many times over the years, so it was only natural that she should turn to him for advice to make her dream of Southern home ownership come true. 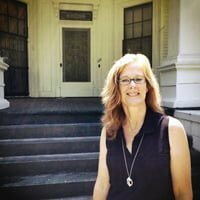 After looking at a number of houses in Mobile, Alabama, she found just what she was looking for in the heart of the city’s Oakleigh Garden Historic District. Built in 1906, the Ford House had been badly neglected in recent years and was in need of extensive restoration to return it to its turn-of-the-century glory. The home is an Arts and Crafts bungalow complete with a wide front porch and beautiful stained glass transom over the entry door. Inside, the house features 11’ high ceilings and a wide center hall that extends much of the length of the three bedroom home. In renovating the house, de Wolde plans to retain as many of the home’s historic architectural elements as possible while incorporating a modern kitchen and bathrooms to make the house more livable. Danny Lipford’s remodeling company, Lipford Construction, will oversee the restoration of the home. Front porch on the historic Ford house. The Southern Romance historic renovation project will be chronicled in a monthly, 13-part series of videos on TodaysHomeowner.com starting in October 2014.